Not so long ago, using the glycemic index (GI) in diabetes education in the United States elicited strong opinions. The authors of a 2004 commentary “Glycemic Index in the Treatment of Diabetes: The Debate Continues,” published in the Journal of the American College of Nutrition, stressed that the American Diabetes Association (ADA) held the view that it was the quantity—not quality—of carbohydrates that was more important in medical nutrition therapy for diabetes, despite positive findings supporting the use of the GI. The authors argued that with such a position, the ADA had essentially dismissed the value of the GI in diabetes management. Flip a few pages forward in history, and the ADA has made room for the GI in diabetes management, asserting that both the quantity and the quality of carbohydrates affect blood glucose levels. A growing body of evidence indicates that carbohydrates with a lower GI may reduce postprandial hyperglycemia and improve overall glycemic control. The ADA now suggests that the first tool for managing blood glucose should be some type of carbohydrate counting, but the use of the GI may be helpful for fine-tuning blood glucose management by providing an additional benefit for achieving blood glucose goals for people willing to make the extra effort in monitoring their food choices. A diet focusing on lower GI foods has the added benefit of promoting a greater consumption of carbohydrates from whole foods such as whole grains, fruits, vegetables, and legumes, in accordance with the 2005 Dietary Guidelines for Americans. While the GI may no longer be officially taboo, it appears that it may have a long way to go before it’s considered a mainstream part of a dietitian’s tool kit. Even in Canada, where the Canadian Diabetes Association advocates the use of the GI in the nutritional management of diabetes, the application of the GI is still controversial. In a study published in the Canadian Journal of Dietetic Practice and Research in 2006, 1,805 dietitians from Dietitians of Canada and the Ordre Professionnel des Diététistes du Québec participated in a survey on their use and perceptions of the GI in diabetes management. Among respondents, 39% used the GI and 61% did not. The GI users were more likely to have a greater diabetes patient caseload, to perceive greater benefits, and to have greater confidence in teaching the concept. Nonusers cited a lack of teaching tools and a lack of knowledge about how to teach the concept as major barriers. In recent years, studies have focused on the effectiveness of using the GI as part of diabetes nutrition education. A randomized clinical trial comparing the effects of a diet featuring low-GI foods vs. ADA nutrition guidelines recommending 45% to 65% of the total diet come from carbohydrate foods was published in a 2008 issue of Nutrition. Forty people with poorly controlled type 2 diabetes were divided into two groups in the study, which discovered that both groups significantly lowered hemoglobin A1c levels and had similar improvements in blood fats and weight. But the low-GI group was less likely to have added or increased doses of diabetes medication to achieve better glucose control. A three-month randomized, controlled parallel group trial was conducted to investigate the effects of a GI-based nutrition education program on blood glucose control among Japanese adults and was published in Diabetes Care in 2007. Forty participants with type 2 diabetes or impaired fasting glucose were divided into two groups to participate in either the conventional nutrition education based on the Japan Diabetes Society guidelines or GI-based nutrition education promoting one half or more of daily carbohydrate intake from low-GI foods. Fasting plasma glucose, total and LDL cholesterol, and body weight and fat decreased significantly in both groups. A1c improved more in the GI group than in the conventional group. The researchers concluded that GI-based nutrition education is effective for improving blood glucose control in people with type 2 diabetes or impaired fasting glucose. In addition, the GI-based nutrition education provided for good adherence and was considered a useful tool. After conducting two pilot studies, the National Institutes of Health announced in June 2008 the planning phase of a study that will test an innovative program of interventions designed to promote the consumption of lower GI carbohydrates from nutrient-dense whole foods. The researchers hope to determine whether such a dietary change will prove effective in promoting improved glycemic control and health outcomes among children and adolescents with type 1 diabetes. 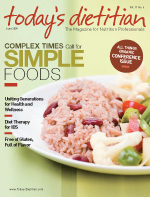 While many studies have relied on traditional dietary education to achieve dietary change, the findings from this study will shed light on issues such as behavioral interventions for youths with diabetes designed to increase the consumption of whole grains, fruits, vegetables, and legumes; mediators and moderators of behavior change; and physiological effects of dietary change. Dietary recommendations will take into account the potential benefits of a lower GI diet, as well as the feasibility, acceptability, and difficulty of implementing these dietary suggestions. Perhaps there is good reason behind the slower acceptance of the GI in diabetes education. Let’s face it: The GI is not perfect. Many factors can affect the GI of a food, including ripeness and storage time, processing, cooking method, and variety. The GI value represents the type of carbohydrate in a food, not the amount typically consumed. A food’s GI is also different when eaten alone compared with combining it with other foods. Depending on the person, blood glucose levels, insulin resistance, and other factors, the GI of a food can vary. Many nutrient-dense foods turn out to have a higher GI than lower nutrient-dense foods. For example, chocolate has a lower GI than oatmeal. And the notion of eliminating high-GI foods from the diet and allowing only low-GI foods has many dietitians worried about people excluding perfectly healthy foods from their diet. Perhaps the best way to include the GI in diabetes nutrition education is to focus on individualization. Saul says, “It’s not a straight numbers game; you can’t just find all the foods with a GI below 50 and eat them. It doesn’t work like that. We talk to people about how high-fiber foods tend to be lower in GI. We suggest focusing on whole grains, vegetables, and fruits. We look at the foods they are eating and ways to make the meal lower in GI. The goal is for people to be choosing lower GI foods most of the time.” She also encourages clients to test their blood glucose levels after eating foods to develop an understanding of their own unique glycemic response to foods.